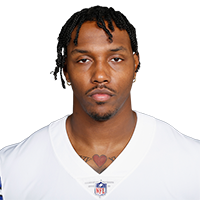 Published: Sept. 16, 2018 at 10:04 p.m.
Dallas Cowboys linebacker Damien Wilson knocks ball out of New York Giants quarterback Eli Manning's hands, Cowboys recover. Published: Aug. 18, 2018 at 08:26 p.m. Wide receiver Tyler Boyd fumbles, and Dallas Cowboys cornerback Byron Jones recovers for the defense.